Prepare yourself to thrust palms skyward in celebration of great legends this Tuesday 25th August. Ricky Nanjero heard my plea for a smashing event. If you thought the last edition of ‘An Evening of Afro Jazz’ was amazing, the Legends edition will surely blow your mind. An evening of Afro Jazz offers the audience a taste of vocalists whose repertoires expand in all genres of music. Ricky Nanjero and his band have invited the legend Eric Wainaina to grace the August Edition. Eric has captured audiences both locally and internationally, headlining many national and charitable functions. His name is not new to Kenyans as he always knows how to woo a crowd with his music which has been intelligently written to last for generations. Eric’s intuitive performances have always been known for both original music selection and style. Eric and Ricky on stage together will be like a ‘music bomb’ waiting to explode. Both of them have been in the industry for quite some time. Their youthful and triumphant spirit has driven them onto the road for huge successes. I really hope that Ricky na Marafiki band do a mash-up with Eric and his band, not forgetting the band that will be the opening act: ‘Royaltyby Black’. They are not novices in the Jazz industry, and if you’re a regular, you may have seen the bands’ members at the ‘Ricky na Marafiki’ shows. 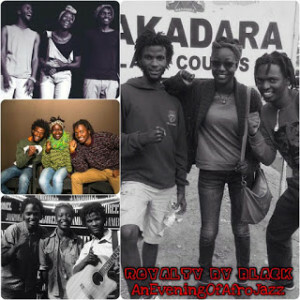 Royalty by Black is such an eclectic band. They have shared the stage with music giants such as ‘Dela’ and the ‘Gogo Simo’ band. They call themselves a rebel family and a voice to the oppressed. To avoid yourself from running for the last minute tickets, you can simply check out Rupu Kenya’s website where you can get a discounted ticket. Or simply go to Mpesa via the Lipa na Mpesa Number 118769 at only Ksh.400. The venue for the event is Alliance Française, Wangari Maathai Auditorium. Get ready to be thrilled. Embrace yourself this Edition’s for music well refined- it is going to be amazing and truly rock!! Ensure before you leave to have photos after the show is over with artists who shall be performing.